My memories are definitely more sight-based. For example, when I think back on this day 11 years ago, my memories are filled with sights. I remember seeing the trail around Lake of the Isles where I was running that morning. I remember seeing the golden color of the tall weeds. I remember seeing the blue skies. I remember feeling how something just felt a bit off - not with anything related to my running, but just in general. I can still see my apartment and my ragged old couch and the endless TV coverage. I can see the mostly empty bar at TGI Fridays where I was covering a shift, watching more endless coverage that night. What's missing from all these memories are the sounds, the smells. I wonder why that is. Do I not pay enough attention to these other senses? Do I focus too much on my sight? I wonder if memories can be shaped to include other senses. What better way to try and test this than by planning a dream fitness vacation! One of my bucket list life goals is to run a marathon or half on every continent besides Antarctica, so why not start with Australia? I'd start my dream vacation off with a race. I'd arrive about a week beforehand to acclimate to the weather and do any finally tapering. I'd really focus on taking in the feel of the sweat on my skin, the smell of my surroundings hopefully not too much of the other runners, and the taste of the post-race food. Of course my eyes would be wide open to see the beauty of the course. After the race, I'd spend a week relaxing at a yoga retreat. I figure this would be a great way to stretch and relax my muscles to aid in a healthy recovery. 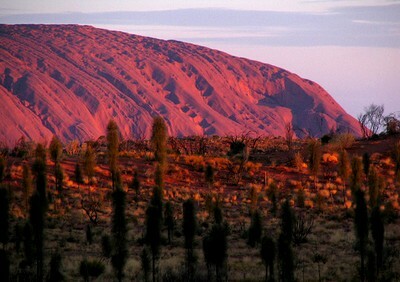 Next up would be to the Red Centre, where I would hike through some of the national parks. Maybe go for a camel ride. Each day of this 4-week journey would be spectacular! In order to try to create memories that aren't just sight-based, I would keep a journal (or blog!) of daily impressions regarding the sounds, smells, tastes, touches of everything I experienced. Perhaps by recording specifics of these other senses, I could walk away from an amazing vacation with more than sight-based memories. Are your memories mostly sight-based? Have you ever tried to specifically enhance your memories of your other senses? Would you like to accompany me on this fitness vacation? What would your dream fitness vacation include?